The Rotex RM8 from Germany company Walther is a British styled rifle, but made in Germany so its feels great when shooting backed up by solid and reliable engineering. 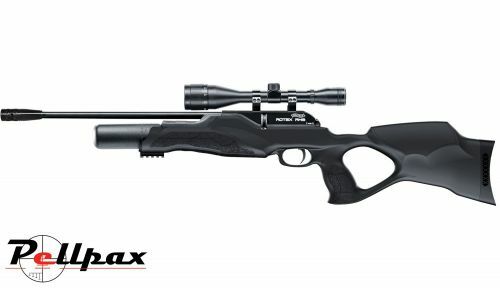 This has ensured that the rifle has been a massive hit since its release and is now available as this Varmint version with a thumbhole polymer stock. The RM8 is based around a bolt action cocking and loading system with an 8 shot metal magazine to hold the pellets before they are loaded. The barrel into which they are loaded is a Walther Lothar barrel, which has a 1/2inch UNF thread at the end, fitted with muzzle break as standard which can be replaced with a silencer. The thumbhole stock is very ergonomic and is made from solid and strong polymer to withstand anything you can throw at it. The forestock now has a weaver rail fitted to make fitting a bipod/torch alot quicker and easier.